To say nothing of its artistic merits, Beyoncé’s Lemonade album/visual album/film is a feat of collaboration, organization, and execution. The budget for the project is estimated to have been about $1.35 million, but when you look at the credits for the album, that almost feels low. Of course, she’s done this before, with 2013's Beyoncé, when she shocked the world by releasing a full visual album seemingly out of nowhere. The self-titled album was shot over the course of about a year and while the album and visuals do make sense as a whole, each video has a very specific theme, style and tone, which makes sense when you consider that they were created by 11 different directors. Before its premiere on HBO, Lemonade was vaguely referred to as some sort of film project. We all assumed it would be another visual album, but I’m not sure how many of us expected such a cohesive vision and story. Lemonade feels like a whole project—it feels like a film. Perhaps, then, that’s why Beyoncé took some different turns this time around with her collaborators and team. Her longtime stylist Ty Hunter, along with Lysa Cooper, are nowhere to be found on Lemonade’s styling credits, although they were heavily involved on Beyoncé. Instead, Marni Senofonte (who styled the “7/11" video) receives the lone stylist credit. 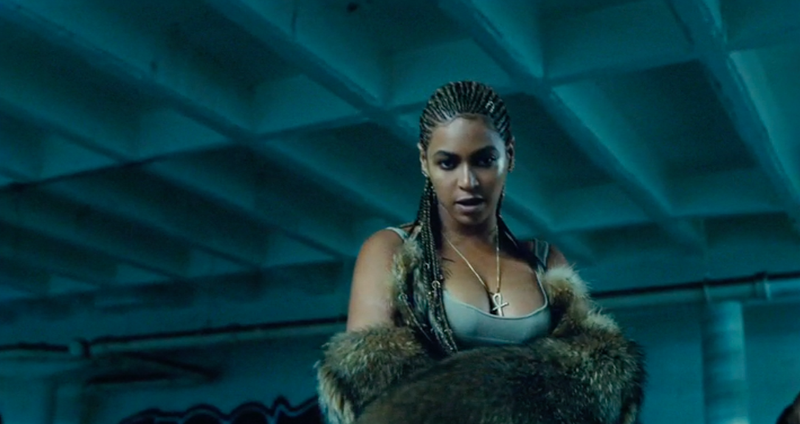 Additional styling is credited to B. Åkerlund, who also worked on Beyoncé. Hair stylist Neal Farinah was a huge part of the self-titled album and although he is listed as having worked on Lemonade, the hair credit goes to Kim Kimble. These changes might just reflect the reality of busy schedules and availability but, more likely, it suggests that Beyoncé is willing to adapt and secure people who can best execute and build on her vision as it evolves. Beyoncé’s sister Solange, who you could almost argue was a catalyst for the project, is the only member of her immediate family not to receive a credit or special thanks on Lemonade. Still, her presence and influence is clearly felt throughout the album, specifically because it was shot in New Orleans, the city Solange lives in and loves. Much of the recording and production of the actual music took place in Los Angeles, which perhaps explains Beyoncé and Jay Z’s move to Los Angeles early last year. You could argue that the expansiveness of the city makes it easier to duck in and out of studios without notice, but I also can’t help but think of the shift as a sort of creative renewal. Only four songs from Beyoncé were not recorded solely in New York City; much of the album was recorded in the Hamptons. It feels like with Lemonade, Beyoncé needed a fresh start of sorts—or at least a new perspective influenced by her physical location. The album was recorded at a long list of LA-area studios. Most curious, however, is a location called “the Beehive in Los Angeles, CA.” A quick search doesn’t find any recording studios under that name, so the most obvious assumption is that the Beehive is a nickname for her home in LA. “All Night” features the horns from Outkast’s “SpottieOttieDopaliscious,” marking the second time she’s sampled that specific section (the other was on the “Flawless” remix). This makes sense because the horns on that song are perfect. The soaring gospel hymm “Freedom,” which features a verse from Kendrick Lamar, includes samples from blues singer Doc Pomus and a portion of a 1959 church sermon. “Freedom” also samples a portion of “Stewball,” recorded by a prisoner from the Mississippi State Penitentiary. When you again consider that almost no information about this project was leaked before its release, you have to believe that some pretty serious nondisclosure agreements were signed—and/or that the loyalty people feel for this woman knows no bounds. Ali De Rosa is listed as the general counsel for Parkwood Entertainment, Beyoncé’s entertainment and management company. De Rosa is listed in the New York State Unified Court System as Alisa Sara De Rosa and appears to have previously worked at Grubman Shire & Meiselas, P.C., which bills itself as a firm for “Entertainment and Media Lawyers.” Beyond that, there is little information about De Rosa. In her “Special Thanks,” Beyoncé calls out her mother Tina Knowles and step-father Richard Lawson, as well as Bert and Amy Yukich, who appear to own a a digital cosmetics company in Los Angeles. A special thanks to the Tampa Bay Buccaneers easily takes the cake as the most random name attached to this project. Turns out, the team just let Jay Z work out at their facilities while Beyoncé prepared for her upcoming tour, kicking off in Miami, which feels extremely generous of her. Finally, the world of Beyoncé is kept on the rails with the help of two executive assistants, Kaleb Steele and Sam Greenberg and one personal assistant, Manuel Mendez. You may remember Greenberg as Beyoncé’s very cool—if a bit too handsy—sidekick who was once featured on Vogue.com. And that’s all it takes, my friends—just a little group of people coming together and working hard—to put together a humble one-hour project fit for Queen Bey.